It was a treasure trove, waiting to be uncovered. The Washington Department of Fish and Wildlife (DFW) had been surveying Puget Sound herring habitat for more than 40 years, but until recently, much of that data remained in the original logbooks, un-digitized and unused. Recent efforts by Puget Sound Institute Lead Ecologist Tessa Francis in collaboration with NOAA and DFW have now made this data more accessible. The scientists hope that it will help to answer some of the key questions behind recent declines in Puget Sound herring populations. The project began as an offhand conversation between colleagues. Francis and NOAA scientist Ole Shelton were studying the possible effect of eelgrass loss on Pacific herring. Herring spawn on eelgrass, among other submerged vegetation, and some have hypothesized that planting more eelgrass will support herring recovery. Herring stocks near Cherry Point in Puget Sound have declined by 90% since 1973, while other populations have remained fairly static. In 2012, Francis and Shelton met with DFW biologist Kurt Stick for advice. 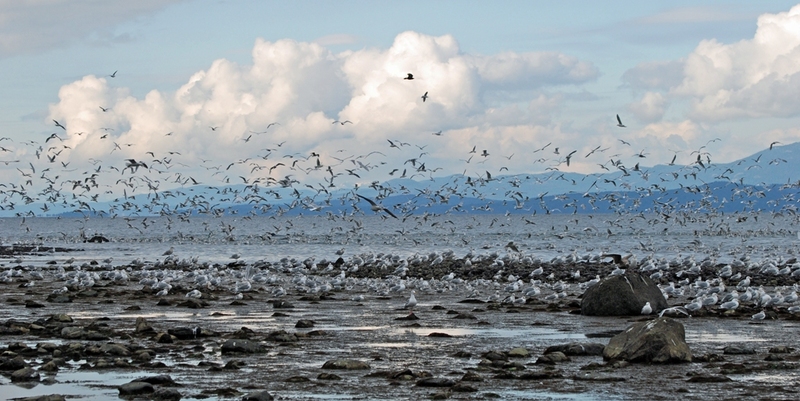 Gulls feeding on herring eggs near Vancouver, B.C. Photo by Guy Monty. Since that meeting, the Puget Sound Institute, in collaboration with NOAA’s Northwest Fisheries Science Center and DFW, has been conducting a massive historical data entry project, funding multiple data entry and GIS technicians to digitize the spatial location of each sample collected by DFW during their herring monitoring program. The data include the date, location and presence/absence of over 30 species of seagrass, kelp and algae. All told, it represents about 200,000 recordings of herring habitat characteristics over 40 years. While DFW has georeferenced all the surveys for one herring stock of particular concern, the Cherry Point herring, and all the Puget Sound data after 2006, limitations in time and resources had prevented them from going much further. As of this winter, the data entry is complete and the analyses are starting. Preliminary results from an initial analysis of data from two herring spawning sites indicate that most of the herring habitat – roughly 60% at each site – has not changed. Changes that did occur varied by species: eelgrass patterns are different from, for example, the invasive brown algae Sargassum muticum—and patterns were not the same across all sites. 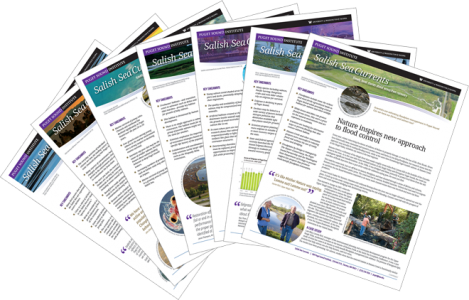 Francis, Shelton and their colleagues hope to address many pressing questions using these data: How has subtidal habitat changed in the last 40 years, and what are the drivers of those changes? 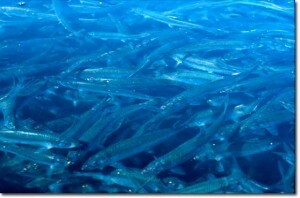 Are changes in habitat related to local trends in herring abundance? What do 40 years of subtidal community composition changes mean for the delivery of ecosystem services? How has the spread of the invasive alga Sargassum affected other species? These data will also contribute to the regional database on eelgrass distribution and patterns in Puget Sound. Read more about Tessa Francis’s herring egg studies. What are the status and trends for Pacific Herring in Puget Sound?